I was contacted by the Canadian Portrait Academy (CPA) when I first wrote a blog entry on the positive identification of Thomas Lawless. I initially saw news of this via my Twitter feed and realised what a good news story it was. I like to keep tabs on ‘news from the front’ and knew that this story fitted the bill perfectly. Little did I know the interest it would generate. Since that first post I have been heartened by the enthusiasm and generosity of those involved in the process to share their time and material so willingly. The CPA have been wonderful in keeping me up to date with events and, through them, I have made contact with Christian Corbet, the sculptor who worked as the Forensic Artist with the Department of National Defence and others to reconstruct a likeness of Thomas Lawless. 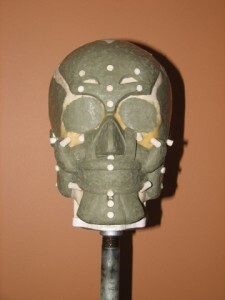 Mr Corbet has kindly agreed to let me post images of his work on the facial reconstruction process. These photos are copyright and reproduced by kind permission of Christian Corbet. They show a few of the stages in the reconstruction process and are clear evidence of the levels of technical quality employed. 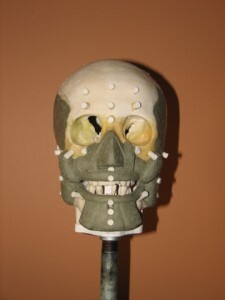 The facial reconstruction procedure was the initial stage in the identification process and the end result (the sculpture) was used by Dr Andrew Nelson of the University of Western Ontario for computer superimpositions in order to identify the subject. Dr Nelson began his work on this particular identification process in 2007. 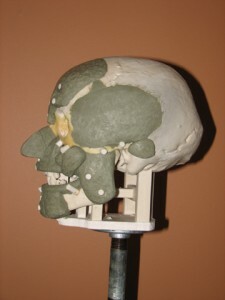 The condition of the remains meant that Dr Nelson reconstructed the bony part of the midface in epoxy resin and a computer model of the skull was then made. 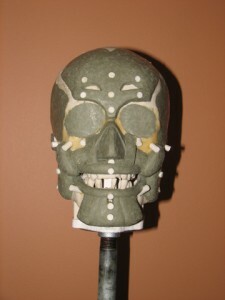 A three dimensional print using bone fragments and photographic superimposition (for the midface) was then created. This gave Christian Corbet the base to work from for a forensic reconstruction of the face (as shown in the photographs). The team had photos of all the proposed subjects and so a comparison could be made between the sculpture and photos. By eliminating those whose facial characteristics did not match, the shortlist was reduced to two soldiers – one from Cape Breton and the other from Ireland. It was at this stage that that Dr. Nelson suggested isotope analysis – the method by which the Irishman, Thomas Lawless was eventually identified. As Christian Corbet wrote to me, this multidisciplinary collaborative project is said to be a first of its kind in identifying a soldier of the Great War. I think that it is the model for future studies and shows what can be done with available resources, time and skilled personnel. Mr Corbet’s protégé Benjamin Trickett Mercer told me that the 3-dimensional sculpture of Thomas Lawless took approximately 5 days to complete. It is estimated that approximately 25 – 30 hours were spent on finishing the formal portrait. Help regarding the accoutrements of a Great War soldier were provided by the costume department of the Canadian War Museum. 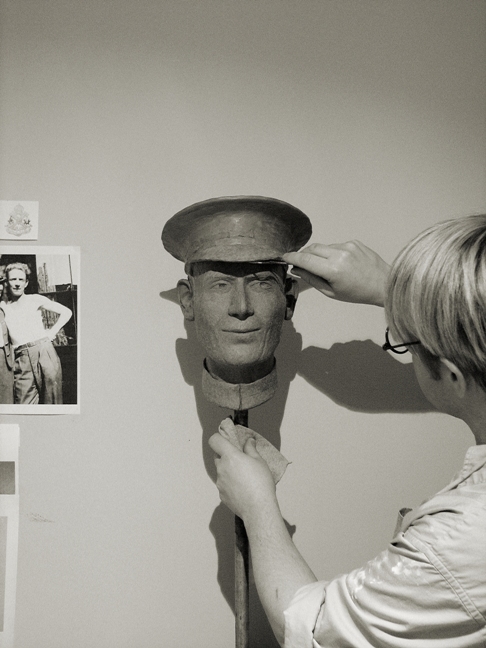 This ensured that the correct regimental badges could be sculpted. They even assisted in the providing the essential but easily overlooked measurements for the size of the soft cap. 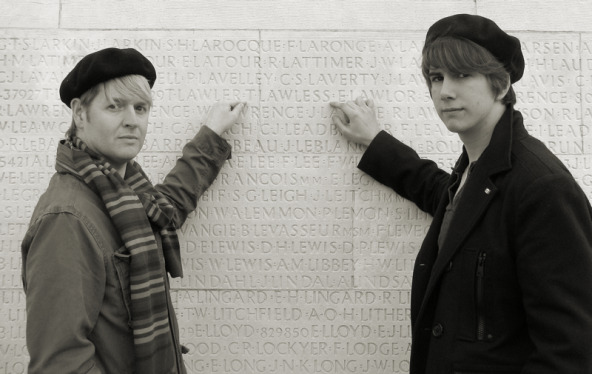 Mr Corbet and Benjamin Trickett Mercer attended the burial service on 15 March 2011. 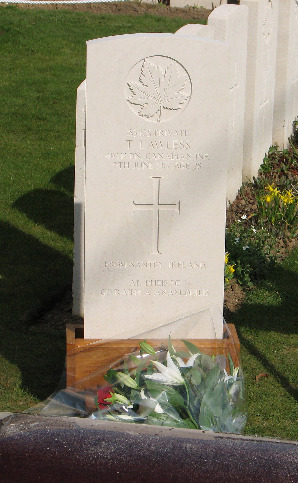 Mr Corbet had the honour to place flowers on the grave of Thomas Lawless on behalf of the Province of Newfoundland and Labrador. On the same note, I received a Press Release earlier from the CPA. It is shown below in italics along with the photograph. 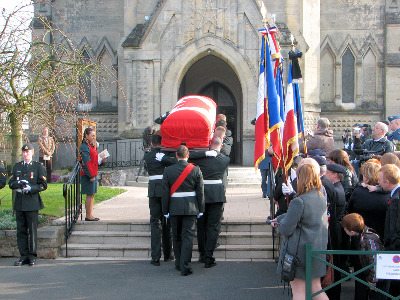 Avion, France – In an act of respect the province of Newfoundland and Labrador paid homage with a floral bouquet at the burial of Pte. Thomas Lawless on 15th March in Avion, France. Premier Dunderdale granted permission to Christian Corbet an Academician of the Canadian Portrait Academy to lay flowers of white lilies and red roses upon the grave of Pte. Lawless. Pte. Lawless’ fought at the Battle of Vimy Ridge and his identity was recently released after he went missing in action in June 1917. This floral tribute was the only one presented from a province or territory from Canada. Christian Corbet presented a floral tribute to fallen WWI soldier on behalf of the Province of Newfoundland and Labrador at La Chaudiere Military Cemetery, France. Photo Credit: Benjamin Trickett Mercer, CPA. 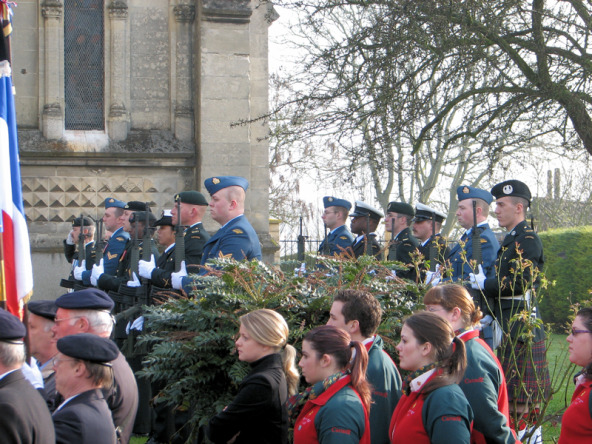 Please find below some more photos of the burial service, courtesy of Christian Corbet. I would welcome any comments you have on the subject. This entry was posted on Friday, March 18th, 2011 at 9:48 pm	and is filed under Miscellany, News from the front. You can follow any responses to this entry through the RSS 2.0 feed. You can leave a response, or trackback from your own site. Thank you for publishing this story Jeremy. I am part of the identification team. (Genealogist) My task is to locate specific living next of kin, for genetic testing and assist with the confirmation of places the soldier lived, for the stable isotope testing. I was unable to attend the burial of Private Lawless. I am pleased to see the photos and your accompanying article. These soldiers deserve our time and effort. They paid for our freedom with their lives. It’s amazing that those who arranged the display of photo and reconstruction did not recognize that the family snapshot could not be of Pte. Thomas Lawson d. WW1. The hair and clothing are clearly of a later date, around the next war, a generation later. Possibly this younger Thomas was named for the fallen one, an uncle perhaps, quite a common practice in war-bereaved families. Bonjour, je me nomme Patrice MACHIN, originaire du village de Givenchy-en-Gohelle, au pied du monument Canadien de Vimy.